One thing that always gives me trouble is figuring out the optimal way to set up my action bars. There are always more abilities to use than can fit on the dozen or so keys that are easily reachable. A section in each guide for laying out the most important abilities for easy access would be quite helpful. We've received a lot of suggestions, like yours, that would involve quite a bit of work. We've written them all down and we'll start working on them after MoP is released. That said, key bindings are tricky to present because they are very subjective, so we need to figure out a way to present them that will prevent people from saying "I bind my abilities like this and I find it much better than what you propose". I think it is a welcome idea although it is quite delicate. Why? Because, largely, you each player's playing style. In my opinion there are three categories of players: Clickers, semi-Clickers and keybinding addicted. For the first category, clicker is a great opportunity to change their style of play and they optimize it. Then the idea would be welcome for newcomers to the game, especially for them. I think that the idea is in good heart, but the implementation should be careful. The reason is that you risk, by telling people "put these in this place on your bars" that what they do now is definitively wrong. That is certainly not what you want to come across as. You should be careful to show a "suggested sample layout", or something. As has been pointed out, there is merit to this idea, but there are also caveats. Having "useful" or "comfortable" key bindings is largely a question of muscle memory. When you first go through a UI overhaul and re-do your keybindings, nothing seems to work and it takes time to get used to them. But after a while, you become used to it and it becomes second nature. Keybinds that some players may find useful, others may not. I've encountered this with real life friends, for who something like ALT+1 was an uncomfortable keybind, while for me it is a very good one. Things such as finger length or keyboard layout matter a lot here. A poster mentioned clicking vs. keybinding. I think that both Damien and I (certainly myself, anyway) assume that everyone who uses our guides does eventually keybind all of their combat abilities. I am aware of the existence of "clickers", but I honestly cannot see any benefit to it whatsoever. I've keybound everything, including mounts, professions and so on. I'm not saying that this is the only viable way (though I can think of many arguments for why a clicker would be at a disadvantage, whereas I cannot think of any for why a "keybinder" would), but if we were to include such sections in the guides, then they would all be done through our perspective and they might, therefore, appear to be unfriendly to clickers. 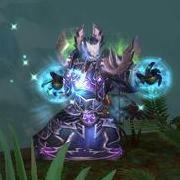 It's true that you can streamline many aspects of World of Warcraft, and boil them down to an easy-to-follow general advice, which is what we try to do in all of our guides. But I'm really not sure that keybinding is one of them. I think that every person is the best qualified to determine the optimal keybinds for them. To do this, you need to actually take some time out and work on your keybinds. Unbind everything, place things in a logical way on your action bars, and go through keybinding them at a slow and throught-out pace. I would say also that keybinding is a place where you really need to "think outside the box". If you're limiting your possible keybinds to 1-6, G, T, F, then you're going to be short no matter what happens. Personally, I don't use the "sideways strafing" that is bound by default to Q and E, so I have those two keys available for frequently-used abilities. I also don't use R to reply to whispers, so I have that one too. And there are many, many more examples of innovation you can do with your keybinds before we even enter the realm of ALT+ or CTRL+ combinations.